As a National Association of Stock Car Auto Racing (NASCAR) fan when I went to Ohio and knew the home of the Indianapolis 500 was only two hours away I knew I would have to make a trip to visit. What I did not realize was how much there was to see at the track. Besides the historical museum located in the middle of the track, there are tours offered ranging from short trips around the 2-mile speedway to getting to see the press box, stepping out onto the track and more. 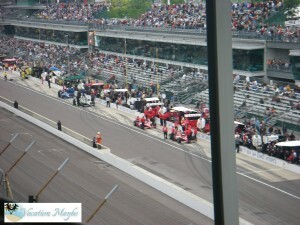 The first few visits to Indianapolis Motor Speedway (IMS) I was there to see the trials for the Indianapolis 500. I loved getting to see the cars race around the track and because it was not a race you had access to pit row, seats anywhere you like and other various spots around the track. 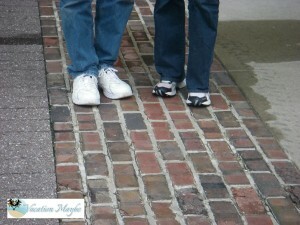 Because the “Yard of Bricks” goes all the way to the infield I was able to get pictures of me standing on the bricks. The final time I visited the Speedway it was on a Saturday where they offered full tours. 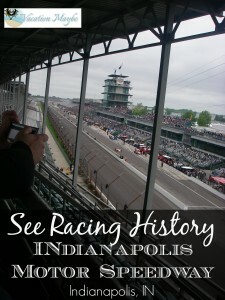 The tour entailed a ticket into the museum and visits to notable IMS landmarks normally open only to officials, drivers and teams during events. The tour took us to visit the timing and scoring suite, the Media Center, Victory Podium, Gasoline Alley (garage area) and of course a loop around the track and a stop on the track at the world-famous “Yard of Bricks” located at the start finish line. It is only available on certain days so make sure you check their website so you can plan ahead.